Despite some storms rolling through very early this morning and providing us some decent rain, we still have a long way to go before we break out of drought conditions. Even after picking up more than half an inch of rain this morning, Rockford is still more than five inches of rain in the hole, and that's just dating back to the start of June. Rain chances are few and far between through the rest of the work week. We will have isolated chances Thursday night into Friday with a cold front, but most of us look to stay dry. Another cold front Saturday night brings better rain chances that will continue into early Sunday before we dry out yet again. The early morning squall line that moved out of Wisconsin into Winnebago County early this morning did not do any significant damage across north central Illinois. Small hail and wind gusts to around 45 mph were reported. There was good news associated with the storms. Some pretty good rainfall amounts were reported. The Rockford airport received 0.53". OK... that's not much, but every little bit helps. The severe drought continues across vast areas of the mid west. Rockford is about seven inches short on rainfall this year, so it would take several good rainfall events spread over a period of a couple of weeks to get soil moisture back to levels where it should be. High pressure over northwestern Wisconsin is pushing a cool front southward across Illinois this morning. All showers and storms are now well southeast of the area and moving southeast. Skies are sunny, and the high temperature this afternoon will be close to 90 degrees. The high pressure will continue to settle to the southeast overnight tonight reaching eastern Wisconsin by sun up on Wednesday. Winds will be light and variable overnight, and it will be cooler with a low around 63 degrees. The high will shift southeast across southern Lake Michigan on Wednesday. It will be sunny and hot with a high around 92 degrees. The wind will become light southerly. It will not be as cool on Wednesday night with an overnight low in the upper 60's. On Thursday it will continue hot with temperatures rising into the low 90's again. A disturbance will pass through the area on Thursday and Thursday night bringing a slight chance of showers and thunderstorms to the Stateline. It will be very warm and humid overnight on Thursday night with a low in the low 70's. The hot weather will continue on Friday when it will be 90 degrees again. On Saturday there will be a good chance of showers and thunderstorms as a stronger disturbance moves across the area. Hopefully, the Stateline will get a good soaking from that system. It's too early to tell, though. A line of very strong thunderstorms with numerous lightning strikes is moving toward the southeast at 30 mph stretching along a line from Crystal Lake to Elgin to just north of Dekalb to north of Rochelle at 3:05 am. A Severe Thunderstorm Warning is in effect for southeastern Ogle, northeastern Lee, and Dekalb County until 3:45 am. There is potental for winds in excess of 60 mph and quarter sized hail with this line of thunderstorms. 2:52am Update: Severe T-Storm Warning for DeKalb, Lee, and Ogle Counties until 3:45am. Quarter-sized hail/60mph winds possible. 2:41am Update: Strong storms continue to roll through Ogle and DeKalb counties, with hail still possible in spots. As you take a look at the radar, areas in white are at greatest risk for seeing hail. 1:32am Update: No T-Storm Warning, but the NWS has issued a Special Weather Statement for storms moving towards Rockford. Half-inch hail and 50mph winds possible, just short of severe criteria. 1:20am Update: Storms are finally moving into the Stateline. Only one warning to speak of at the moment... that's in northeast Walworth County in Wisconsin. That lasts until 1:30am with 60mph winds the biggest concern. Non-severe storms are currently in northern Winnebago County, heading southeast towards Rockford and should be rolling into town between 1:30am and 2:00am. Some small hail isn't out of the question, along with some gusty winds, although it doesn't look like we'll meet severe criteria. There's also quite a bit of lightning associated with these storms, so even though they may not be severe, these storms will still pack a little punch... meaning BE CAREFUL! 9:30pm Update: Rain chances are slipping away as we get further into the evening. Radar At 9:23pm shows a line of non-severe storms still well north of us. A few scattered are still possible as we get closer to midnight and the passing of the cold front, but don't be surprised if most of us stay dry tonight. Another update is on severe weather chances. SPC has cut us out of the slight risk, with any current warnings well to our northeast. Any storms we do see tonight could produce some gusty winds, but it doesn't look like they will reach severe limits. 3:48pm Update: A cold front sitting to our north could provide some storms chances for the Stateline later this evening. With these rain chances, however, comes a slight chance for strong to severe storms. A Severe T-Storm Watch is currently in effect until 8pm for the northeastern parts of Wisconsin and Michigan's upper peninsula. The Storm Prediction Center has the risk for severe weather extending south into the Stateline. Possible storms could produce strong winds and some hail, even if they do not become severe. Radar as of 3:42pm shows a few isolated storms developing to our north, but no severe weather at the moment. We'll keep you updated through the day on the First Warn Weather Blog and bring you the latest forecast on WTVO Channel 17 News at 5, 6 & 10 and Fox 39 News at 9. The heat will return today after a break on Sunday when the high was only 81 degrees. Interestingly enough... the day averaged cooler than normal for the first time since June 26th. Every single day since then has been above normal. It will be mostly sunny today, and temperatures will be back above average once again with a high in the low 90's. A cool front will approach the Stateline later today, and will be located from near Green Bay, Wisconsin to near La Crosse to Sioux City by 6 pm this evening. Scattered showers and thunderstorms are expected to break out along and ahead of the front by 6 pm this evening. A couple of those storms could approach severe limits with the possibility of damaging winds and large hail. Some thunderstorms may linger until after midnight as a cool front drops southward across the area. The overnight low will be in the upper 60's. There will be a few clouds to start the day on Tuesday, but skies will become sunny during the morning. High pressure over Minnesota will feed in a northerly breeze around 10 mph. Don't expect temperatures to cool down very much. The high temperature will top out near 90 degrees on Tuesday, Wednesday, and Thursday. A couple of systems may affect the area by Thursday, so there will be a slight chance of showers and thunderstorms developing. A stronger system moving through the area on Saturday will increase the chances of showers and thunderstorms. High pressure from Canada will switch winds around to the north on Sunday. Cooler and drier air will move in from the north. The high will be in the middle 80's under sunny skies. A weather system over the plains has caused an area of showers and thunderstorms to develop to well our west over Iowa. Some high cloud cover from that area of showers has overspread parts of the Stateline. It will be partly cloudy overnight over most of northern Illinois, but there will be a slight chance of showers, and possibly an isolated thunderstorm over far northwestern Illinois after midnight. The overnight low will be in the low to middle 60's. On Sunday the disturbance to our west will move into the Stateline, and scattered showers and thunderstorms will develop. Only about 30% coverage is expected, so very little relief from the severe drought will happen with this system. The high temperature on Sunday will be around 86 degrees. No exceptionally hot weather is expected next week. That said... it will still be quite warm with every day through next weekend remaining above average with highs in the upper 80's and lows in the mid to upper 60's. Chances of rainfall will remain low with the next chance of rain on Thursday and Thursday night. Rainfall amounts forecast for the next week will also be low with general amounts no more than half an inch. The severe drought will not have much chance for improvement during the next week. It's no surprise that this summer's heat has been unusual. Here's another example. Rockford is experiencing one of the longest streaks of 80 degree days on record. As of Friday, we are at 44 straight days of highs at or above 80 degrees. Look for us to keep moving up that list over the course of the next week. The current forecast shows a nice weekend with highs back into the 90s starting Monday. While the all-time record might be tough to break (We would have to stay in the 80s through Sept. 8th), we could easily move into second place if warm temps hold through the next two weeks. We'll remain sandwiched between a ridge of high pressure in the west and a trough of low pressure in the east next week. This leaves the middle of the country with extreme heat while closer to home it looks like we'll actually remain near or slightly above average. Temperatures next week are forecast to remain in the upper 80s to near 90 degrees. The placement of the jetstream overhead will allow subtle upper level disturbances to move through the western Great Lakes which will increase the probability of rainfall extending from Minnesota southeast into the Mid-Atlantic. While no one day will be a complete washout and we'll likely see many dry hours, the daily chance for showers/storms will remain through the end of next week. 4:27pm Update: A Severe T-Storm Warning continues to Lee and southeast Ogle (including Rochelle) counties until 4:45pm. Storms are moving out of Rochelle and Ogle county as we speak, with the majority of storms still moving through Lee. Sublette, Compton, Paw Paw, and Lee. Storms are capable of 60mph winds and some hail. 4:00pm Update: A Severe T-Storm Warning is now in effect for Ogle and Lee Counties until 4:45pm. These storms are capable of quarter-sized hail and 60mph winds. Storms in Whiteside County are also strong, but no warning at this point. Those storms are capable of 55mph winds. 3:30pm Update: Storms are currently moving across the central parts of the viewing area, with a line going from Rockford to Sterling. While there are no warnings with these storms, they could produce 0.50" hail and 50mph winds. The strongest of the storms are currently moving into Ogle County. We have already received reports of small hail in parts of Ogle County. Stay with us through the afternoon for the latest on these developing storms. A severe weather watch may be issued for parts of Wisconsin and possibly extreme northern Illinois this afternoon. High dew points and an approaching low will keep the threat for scattered thunderstorms; especially later this afternoon and evening. The greatest threat will reside in Wisconsin but with such a moisture rich atmosphere there may be a few storms that develop south into Illinois. Greatest threat from these storms would be hail and occasional wind gusts. Thunderstorms that moved through overnight and early this morning will continue to march east by mid-morning with a few breaks coming in the cloud cover. Until then showers moving in from the southwest will continue through 8am-9am. While the strongest storms remained north in Wisconsin a gust front produced wind gusts between 55mph and 60mph roughly between 12:30am and 1:30am. This was enough to bend a few tree branches and even bringing down a few of those tree branches. Temperatures this morning are starting off in the low 70s and with a few of those breaks expected highs look to rise in the upper 80s close to 90°. A weak upper level disturbance will move in from the northwest this afternoon and with a little lingering moisture around that may be enough to generate a pop up thunderstorm or two by late afternoon and evening. A secondary cold front will sweep through overnight and bring drier air to the Stateline by Friday. Temperatures will remain in the mid 80s Friday with the mid and upper 80s by the weekend. By next week the jetstream will be positioned from northwest to southeast with a few subtle little disturbances rippling through. This will keep temperatures in the upper 80s with a few isolated storm chances Sunday through next Wednesday. 3:05am Update: A few stronger cells have developed in Whiteside county early this morning and are currently moving northeast along I-88. Areas impacted with be Prophetstown, Morrison, Sterling and Dixon. These storms will be moving through central Lee county by 4am. 2:50am Update: There have been a few storms that have redeveloped this morning extending from Janesville southwest near Winnebago, Ridott and Byron. These storms will continue moving northeast with frequent lightning, a few stronger wind gusts as well as heavy rain. At this time there is no severe weather. 1:13am Update: A High Wind Warning has been issued for Winnebago, Ogle, Lee, Boone, McHenry, and DeKalb until 3am. Winds of 60mph+ will be possible as storms continue to be scarce across northern Illinois. 12:45am Update: A gust front is developing ahead of storms to our west and moving quickly into areas from Janesville into Rockford. A gust front is a line of strong winds moving out ahead of the storm. On the radar, it's the greyish line just west of Rockford. Winds will be strong (50-60mph) and could cause some minor damage and power outages over the next couple minutes. 12:37am Update: A Severe T-Storm Warning is in effect for eastern Rock and western Walworth Counties in Wisconsin until 1:45am. Another warning remains in effect for Rock and Green until 12:45am. 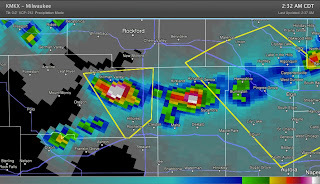 These storms are capable of winds up to 70mph and quarter-sized hail. The rest of the Stateline remains fairly quiet with a few scattered cells, including one moving into Ogle County. 11:57pm Update: Radar still showing storms off to our west, but some are now starting to push in the far northwest parts of the viewing area (Jo Daviess County). No warnings at the moment, but the Stateline continues to be under a Severe T-Storm Watch until 3am. SPC says strong winds and heavy rain are still possible, even if they don't reach severe limits. 10:45pm Update: Strong storms are lining up to our west, but nothing in the Stateline just yet. Storms are moving mostly to the east with a little bit of a northerly component, so it will be a few more hours before these storms really push into the heart of the viewing area. Most of the viewing area is under a Severe T-Storm Watch until 2 or 3am (depending on whether you're in Wisconsin or Illinois, respectively). The main threat will be strong winds up to 60 or 70mph, but some small hail has been reported with storms in Iowa. Our live chat is up if you have any questions or storm reports. Stick with the First Warn Weather Team for the latest on any severe weather updates. Wednesday will be another hot and humid day out there. A Heat Advisory will be in effect from 11am until 10pm across most of Illinois and southern Wisconsin as a warm front lifts northeast over the area. Temperatures will start out in the 70s during the early morning hours, but will quickly rise going into the afternoon, reaching near or just over 100 degrees. The heat index is expected to reach into the 100-110 degree range. After the warm front lifts northeast over the area, we will be watching a cold front out to our west start to push east towards the stateline as the area of low pressure moves across southern Minnesota and central Wisconsin. This will bring another chance of rain/thunderstorms going into Wednesday evening and overnight into Thursday. The front should clear out of the area by Thursday afternoon, which means the chance of storms could last through Thursday morning before the skies begin to clear out heading into the weekend. Taking a look at the convective outlook put out by the Storm Prediction Center, some of the storms late this afternoon and through the late evening hours could be on the strong to severe side, as we are in a slight risk area for severe weather. The biggest threats from these storms would be heavy rains, strong winds, and possible hail. The risk of severe weather will be reduced going into Thursday morning as the cold front passes through the area late Wednesday night. The chance of storms will be reduced heading into weekend as high pressure moves into the region on Saturday. Right around 5am a line of strong thunderstorms moved across southern Wisconsin and northern Illinois knocking down trees and power lines causing several thousand to lose their power. These storms originated northwest of here in Minnesota late yesterday evening and began to gain a little momentum as they moved southeast. A stationary front to the south helped provide the instability needed for these storms sustain themselves through not only Illinois but Indiana and Ohio as of late this morning. Dry air aloft is something meteorologists look for when storms develop on the radar. This is because some of that dry air, as well as stronger winds, can be transported down to the surface and can typically cause stronger winds along the leading edge of the thunderstorm. Also, the fairly tight front edge reflectivity gradient (where the radar color changes) was noticeable also indicating that there were strong winds aloft likely being transported down to the surface. Warnings had been issued for southwestern Wisconsin around 3am, with warnings for Green county shortly after 4am. 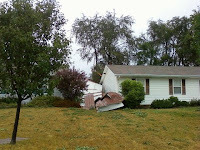 As the storm continued southeast the leading edge began to bow out as in entered far northwest Winnebago county. The strongest part of the storm moved from Beloit/South Beloit to the Roscoe/Rockton area with damaging wind gusts between 55-65 mph. As the storm moved southeast it began to pick up a little momentum as it entered Boone and McHenry counties and winds were clocked over 65 mph in Harvard, IL. At the same time there was further development along the southern edge of the storm as it moved through northern Ogle and DeKalb counties. Wind gusts in those locations were also near 60 mph, if not higher. The storms completely moved out of the viewing area around 6:30am as they continued east towards Chicago. Some may classify this storm as a derecho, which is a long-lived wind producing storm. In fact, the storm is now located in southern Ohio! For the remainder of the afternoon cloud cover may thin some with temperatures rising into the mid 80s. With the stationary boundary still in place there may be an isolated storm or two later this afternoon, but a better chance arrives tonight, especially north, as the front lifts into Wisconsin by Wednesday morning. A stalled out frontal boundary south of Rockford will act as the interstate for storms further upstream to follow. Showers and thunderstorms near La Crosse, WI this morning will continue to travel southeast and should they hold together will move into northwest Illinois within the next couple hours. The severe weather from earlier this morning has helped stabilize the atmosphere a little so what's coming in from the northwest isn't anticipated to be severe. All severe thunderstorm warnings have expired for the viewing area. There have been numerous reports of power outages across northern Illinois as well as reports of trees/tree branches down on roadways. If you encounter an intersection that is without power remember to treat it as a four way stop. 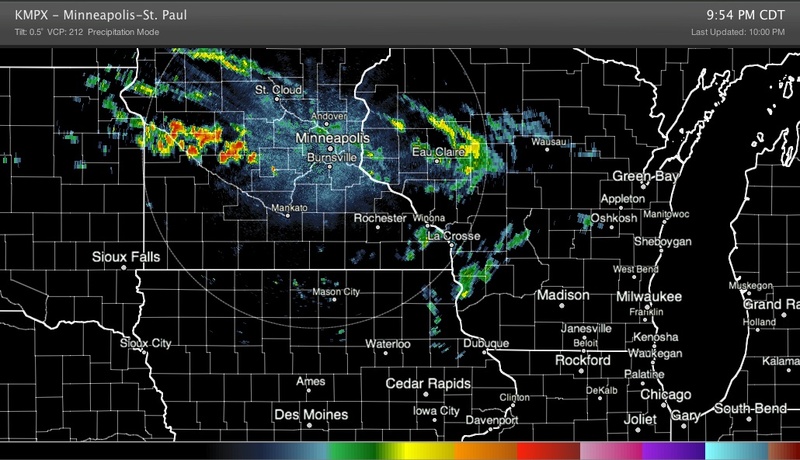 There are a few more showers/storms upstream moving out of Minnesota that may be here later this morning. With the stalled boundary just to our southwest the storm threat will continue into the afternoon. (6:09:43 AM) nwsbot: Local Storm Report by NWS LOT: DE Kalb [Dekalb Co, IL] emergency mngr reports NON-TSTM WND DMG at 05:35 AM CDT -- tree and power lines down blocking intersection of bethany road and first street. winds estimated at 70 mph at kishwaukee hospital in dekalb. (5:57:50 AM) nwsbot: Local Storm Report by NWS LOT: DE Kalb [Dekalb Co, IL] emergency mngr reports TSTM WND GST of M56 MPH at 05:40 AM CDT -- at northern illinois university. 5: 55am Update: Severe Thunderstorm Warning for Boone, Winnebago and Ogle counties has been expired. 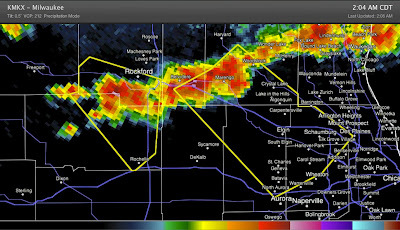 However, the Severe Thunderstorm Warning continues for DeKalb and McHenry counties until 6:30am. Strongest of the thunderstorms moving through through McHenry county where a 67 mph wind gust was reported in Harvard. There have been several reports of tree branches down when the intial line came through. Once this band passes skies will remain mostly cloudy with a few scattered showers through the morning. 5:25am Update: Strongest part of the storm now entering into western Boone county. 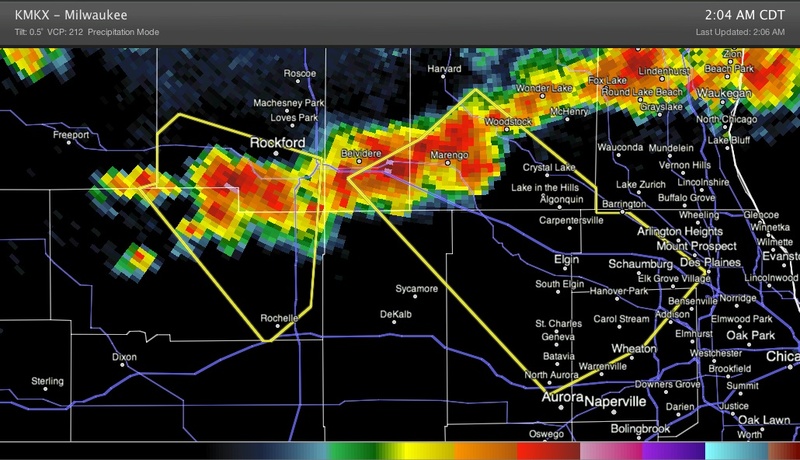 A Severe Thunderstorm Warning continues for Winnebago, Boone, McHenry, Ogle and DeKalb counties until 5:45am. There have been numerous reports of wind gusts near 60 mph along with numerous reports of tree branches down. Heads up near Belvidere, Capron, Caledonia and Poplar Grove. These storms will continue to produce strong winds, frequent lightning and heavy rainfall. (5:05:39 AM) nwsbot: Local Storm Report by NWS MKX: 2 S Janesville Airport [Rock Co, WI] trained spotter reports TSTM WND GST of M52 MPH at 05:02 AM CDT -- peak gust before lost power. Severe Thunderstorm Warning continues for Green county until 4:45am. Storms extend from Madison southwest to near Warren in far southern Stephenson county. Heavy rainfall and brief, gusty winds will remain possible. A line of severe thunderstorms are currently moving through southwest Wisconsin and will continue to move southeast around 45 mph. I expect the southern edge of this line to move through Jo Daviess and western Stephenson county within the next 45 minutes. Wind gusts near 50 mph, or greater, heavy rain and frequent lightning can be expected. It's been a fairly quiet night around the Stateline so far, but we'll still expecting showers and thunderstorms as we roll through the rest of the overnight. 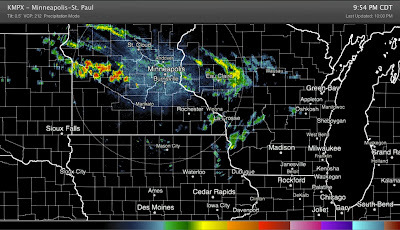 Current radar (around 10pm) shows showers in Wisconsin and thunderstorms firing up in Minnesota. Everything is basically moving southeast, so it's the storms in Minnesota we're keeping an eye on. Obviously, it will take some time for these storms to make to the Stateline, so it will be well after midnight before we start to see any significant activity. While there are no watches or warnings with these storms, the possibility is still there. The Storm Prediction Center still has us under a slight risk for severe weather through the morning. The main concern is strong winds with some hail and heavy downpours which could cause some flooding concerns. Stay with the First Warn Weather Team through the night for the latest on any developing severe weather. Some Drought Relief on the Way? 100 degrees on the Way Again? The Heat Is On... Still! We Need This Break in the Heat! The Heat Wave us Over!